This re-settable flashback arrestors offer four (4) safety devices in each unit. Safety features include protection against flashbacks with a wide range of mixtures of oxygen or air with flammable gases including hydrogen, acetylene, methane, and LPG gases. The design includes a built in non return (check) valve to stop reverse flow and a thermal shut off which stops gas flow in the event a of hose or pipe line fire. 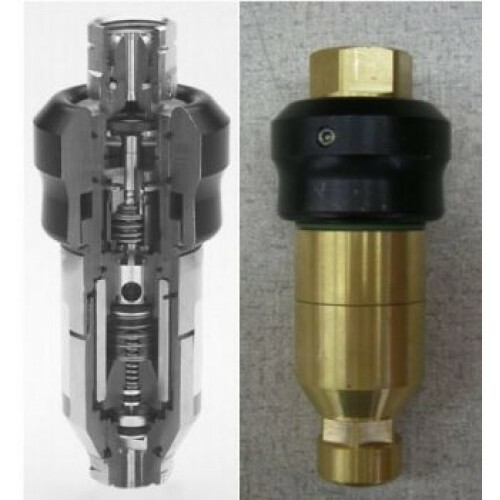 An easily re-settable pressure control stops gas flow in the event of reverse flow or a flashback that creates 10 psig back pressure. This feature alerts the user that a reverse flow or a flashback of greater than 10 psig has occurred. These units are easily re-set by pulling up on the pressure control ring (shown at right), no disassembly of the gas line or special tools are needed. The 8491 Series high flow capacity makes them suitable for a broad range of applications (see flow table). Units are U/L listed and meet ISO 5175, EN 730, BS 6158, and AS 4603 standards.